Paragon Provide 3M™ Prestige Window Films that help protect your home from damaging sunlight. A higher standard for fade protection. Both financially and emotionally, you’ve made a tremendous investment in your home or office space. Once that investment is made, the next step is keeping it looking beautiful. Unfortunately, fabrics, wallpaper, natural wood floors, photos and other valuables will fade when unfiltered sun shines through your windows. 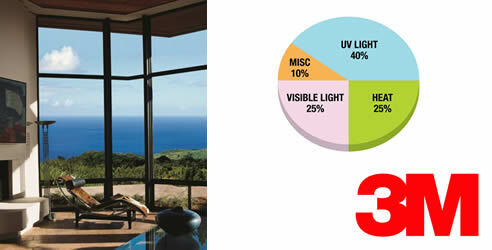 Paragon’s 3M Prestige Window Films address the three major causes of fading. 3M Prestige Window Films are designed to reduce the effects of solar heat and visible light on your furnishings and will block up to 99.98% of the sun’s harmful ultraviolet rays, which are the single largest cause of fading. Depending on the film you chose, you can enjoy a 79% reduction in the sun’s heat. While no film can stop fading completely, our films dramatically slow the progress of fading to keep your home looking beautiful. When it comes to protecting your home or office, you want to deal with a company you can trust and products you can trust. No one has more experience with window film. In 1966, 3M received the first patent for window film and they continue to invent new ways to make your life brighter. Today there are millions of square meters of 3M Window Films installed all around the world. Few things are as frustrating as working on a computer screen or trying to watch television in a sunlit room. By significantly reducing glare, our films help you do your work or relax without the added eyestrain from excessive light. Increased comfort and energy savings. On a warm day, the sun shining through your windows can drastically increase the warmth of a room. Not only do you become more uncomfortable, all that heat is costing you money when your air conditioner tries to keep up. By rejecting up to 79% of the sun’s heat, our film can significantly reduce your energy bill.